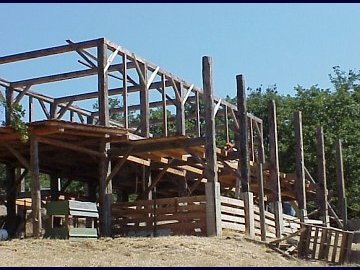 This is the timber frame of our Oregon barn. The 8X8 posts were milled out of Pacific Yew wood using the Alaska mill. This was one of the most arduous tasks I've ever performed using the chainsaw jig. Yew wood is famous for being very dense and difficult to cut. In most instances it required three chain sharpenings to make one pass on one side of the timber. All tolled there are 24 Yew Wood posts in the structure. Yew Wood is famously resistant to decay. There are posts in the ground in this area that have been there for 100 plus years.